Skylanders Imaginators delivers an innovative and coherent experience once again, adding additional value to the Skylanders series. As has been true throughout the series, Imaginators’ additions not only extend playability but are integrated within the narrative and progression of the game. 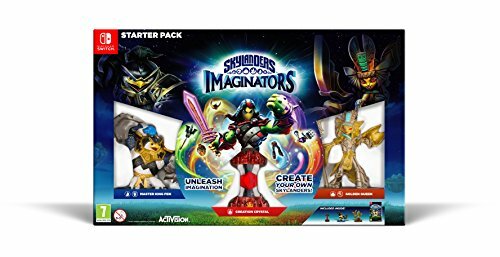 Rather than introduce another pre-packaged figurine novelty for this year's Skylanders game, Imaginators puts character creation in the hands of its young players. From top to bottom Skylanders Imaginators focuses on a creation tool that snaps together different body parts of the in-game characters - which are also represented as physical toys that can be purchased and “teleported” into the game via the plug-in Portal (which is included in the Starter Pack) - to create a near infinite array of heroes to play with. Does this years Skylanders successfully reimagine the formula, then, or does it just feel like more of the same? Before you get too excited about the endless possibilities, the need to buy plastic toys inevitably persists as each character needs what's called a Creation Crystal in order to be saved into. The Starter Pack comes with one Crystal that enables you to create a character for one elemental type. In Imaginators there are different elements and character classes - to work these into your creation you'll need to buy additional Crystals. So the persistence to purchase doesn't go away for this year's game. Strangely once you have selected a class for a particular Crystal you can't reset it and begin again. Which is a pain. The Imaginators Starter Pack also come with two new Sensei figures, which can be played in-game by popping them onto the Portal. These new characters have the additional benefit of being able to train your created Skylanders and imbue them with additional abilities. Along with the Sensei figures are returning Villains, now playable as good guys. Similar to what was seen in Skylanders Trap Team but here writ large in physical form and with expanded upgrades and abilities. Both Senseis and Villains are again impressive in both design and characterisation. They are beautiful to look at, tactile to hold and well realised on the screen. Although the classic characters aren't returning to the storyline this year - as they have in previous Skylanders games - Imaginators does support all 300 or so of the old characters so you can make use of your existing collection of figurines. Or find some bargains in the second-hand bin. As you play through the main game and explore the impressive open world you add to your stock of character parts. At any time while you are playing you can pause the action and jump into the character creator to adjust or add a newly acquired part. An additional step on the monetisation of all this is the inclusion of in-game purchases of Imaginite chests that are then opened to acquire new parts. Parents should be aware that this will be added to the list of items for which children will pester. Skylanders Imaginators review: Value for money? While it's easy to get distracted by the ins and outs of the commercial side of Skylanders, the amount of value on offer with just a Starter Pack is impressive. Not only can you complete the main story without purchasing extras but Imaginators also includes all of last year's SuperChargers kart racing tracks and some digital versions of the vehicles. There are many hours of fun to be had here without spending an extra penny. Adding in a bunch of second-hand figures and vehicles will also expand the experience while keeping costs to a level affordable with pocket money. The game itself is familiar territory for anyone who has played the series before. In a nod to the recently released Skylanders Academy cartoon on Netflix the classic Skylanders characters are used as narrators in the game and the production quality is really high. It feels polished and looks impressive on the PlayStation 4 version we tested. The collecting of character parts is well integrated within the narrative and the whole experience holds together rather well. Even when you've finished the main game there is plenty of reason to replay levels and collect more parts. Indeed the desire to expand the creators toy box could well have children playing Imaginators many times over - further extending the value for this year's title. There are some nice (although costly) extensions to the character creation side of the game too. Firstly there is a free app that allows you to design and transfer Skylanders from the game to your smartphone or tablet. Once in the app you can then order t-shirts (£25), NFC cards (£15) and even 3D printed physical versions (£50) of your children's creations. Not cheap, sure, but about the going rate for these kinds of bespoke products. The NFC cards and the 3D figures are fully functioning and allow you to bring the character back into the game by placing them on the Portal. You can then continue to customise them as much as you wish. These are nice to have although at the price point limits affordability. Similar to last year's Nintendo character integrations within the Skylanders world, Imaginators adds Crash Bandicoot characters and levels for 2016. Initially available via an exclusive PlayStation Starter Pack but available more widely at a later date, these characters will tick boxes for those who remember the classic game. Gameplay and visuals in these levels are changed up to mirror those classic Crash experiences. Both the physical figure and on-screen action looks the part, and offer parents a novel way to revisit younger gaming years with their children without dusting off the PlayStation 1. Skylanders Imaginators delivers an innovative and coherent experience once again, adding additional value to the Skylanders series. As has been true throughout the series, Imaginators' additions not only extend playability but are integrated within the narrative and progression of the game. Provided parents ensure children have completed the Starter Pack content before buying too many additional figures, Imaginite chests, Creation Crystals or bespoke character 3D prints Imaginators offers a huge amount of value. There's plenty of backwards compatibility too. Skylanders Imaginators is out now for PS4, PS3, Xbox One and Wii U.